Is an event unfolding before our eyes? In Operations Management, as well as some other fields, researchers like to study how people react to various announcements or events about a company. This is called an “event study”. Typically in such studies, the wisdom of a crowd is captured through the price of a company’s stock to which an event is related. Of course, the company needs to be big enough and traded on an exchange. My colleagues Vinod Singhal and Kevin Hendricks have done a lot of work on these studies. 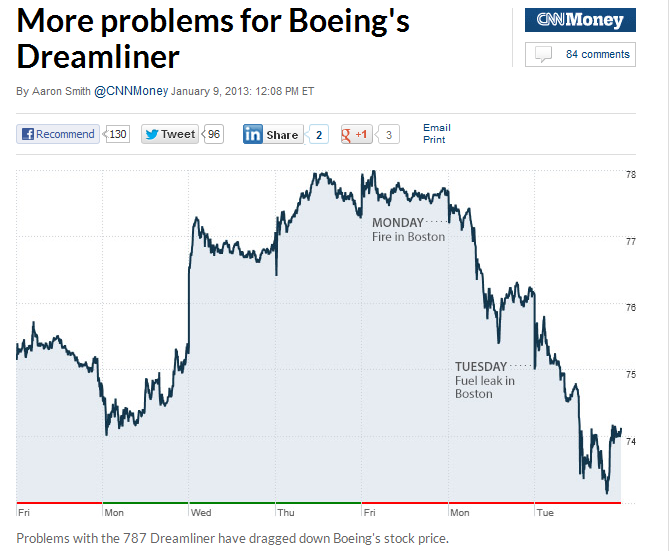 In that sense it is interesting to watch what is happening to Boeing now. Five customers are potentially affected by the defects, David Vieau, the company’s chief executive officer, told reporters today in a conference call. The root cause of a $107,000 Fisker Karma model shutting down in tests this month by Consumer Reports is associated with A123’s defective batteries, Vieau said, without naming other customers. The cause of the defects described today was faulty calibration of one of four welding machines in the Michigan plant that caused misalignment of a component in some cells, Vieau said today. The flaw could cause an electrical short, which could result in premature failure of the battery or decrease performance and reduce battery life, he said. While the rate of total cells welded by the faulty machine is “a fraction” of the product A123 made in the Michigan plant, the probability is “very high” that a module or pack contains a defect because of the number of cells that go into them, Vieau said. “We feel that virtually all the product that we produce in this facility has been effectively contaminated by this particular defect,” he said. First, it is commendable that A123 has identified the root cause and were able to nail it down to a particular production step, and they’ve done so pretty quickly. Second, the case underscores the importance of quality management when there is a massive interaction between components in a product. One faulty part out of a thousand can trigger a chain reaction, thus leading to the failure of the entire product. In this case, it is surprising that such possibility was not prevented by the design of the battery. A123 seems to be doing well in terms of damage control though. For one thing they are undertaking the replacement of $55M worth of batteries made at the Michigan plant. Also they are upping warranty terms on Karma’s batteries, clearly betting on the future demand. Such level of interaction between the companies is remarkable. Probably it has to do with the fact that A123 holds a stake in Fisker who is its major customer. What could the Fed learn from GM? This is another topic I wanted to write about for a fairly long time – Quality. When I think about quality – the first thing that comes to mind is cars. In fact just about 10 years ago (I was buying my first car back then) the quality was a big issue. I took some comfort though in knowing that there are lemon laws were around, and got a relatively trouble-free Nissan. The newfound emphasis on quality has closed the gap between best and worst in the industry. In 1998, J.D. Power and Associates, which surveys owners about trouble with their cars after three years, found an industry average of 278 problems per 100 vehicles. By this year, the number fell to 132. In 1998, the most reliable car had 92 problems per 100 vehicles, while the least reliable had 517, a gap of 425. This year the gap closed to 284 problems.